Some very special things happened to us these last two days as pilgrims. 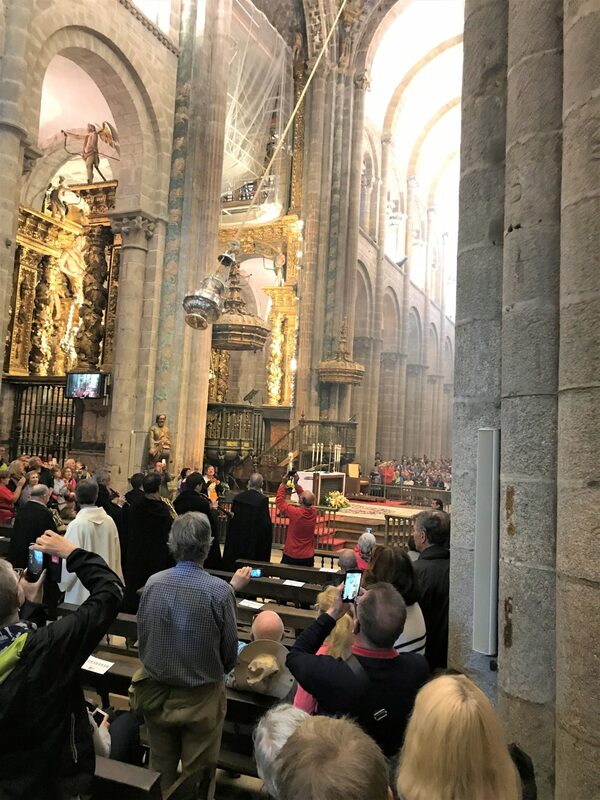 This post is a long one because it encompasses two special days in Santiago de Compostela. I hope you get the opportunity to read it all. The Pilgrim Office opens at 8:00 am and we arrived right before they opened. The line had already formed on the street. As soon as they opened things moved quickly and we were able to get our Compostela within the hour. So my advice is go stand in line by 7:30 am. If you wait until later in the day, the wait just gets longer. It took Steven well over an hour to get his yesterday and that was around 4pm. I assume this gets even worse as the summer progresses and more pilgrims arrive. The Pilgrim’s Office decision to let go of the full-time employees and staff the office with volunteers saved them money. However, just when a volunteer gets fast at processing the documents, they move on. If you want your Compostela or your certificate of completion, you’re going to have to spend at least an hour of your day standing in line. Here we are right before we get to the counter where you present your credential and fill out the form needed to obtain your Compostela. From this point you are about 10 minutes away. The screen above the doorway tells you how many positions are available and which is open. Below is my credential. 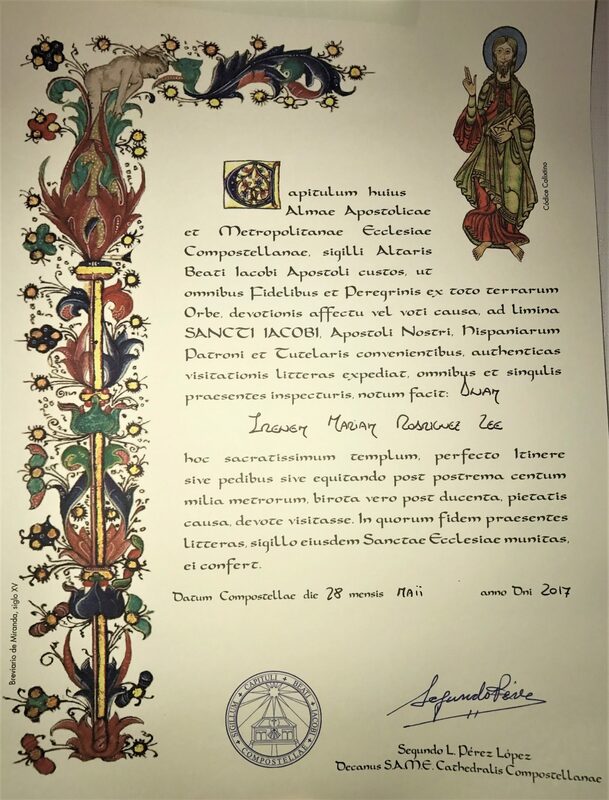 This is what I presented as proof that I had walked the last 100 km into Santiago. Mine has less stamps than those who walked the Camino Frances because our pilgrimage was only 324 km. The Frances is 800 km so they naturally get more stamps. This credential is what proves to the albergues along the way that you are a pilgrim and allows you access to the pilgrim only hostels. Stamps can be obtained at churches, albergues, many bars, and little chapels that you find. The final stamp on the far right is from the Pilgrim Office on behalf of the Cathedral of Santiago. The Pilgrim Office records the distance from Oviedo as 334 Kilometers. Every guide I’ve seen says 324. I assume it has to do with some of the rerouting that has been over the years to keep the route from intersecting with major roads. has completed by foot, bicycle or horseback at least 100 kilometers and visited very devoutly this Sacred Church in a devout sense. 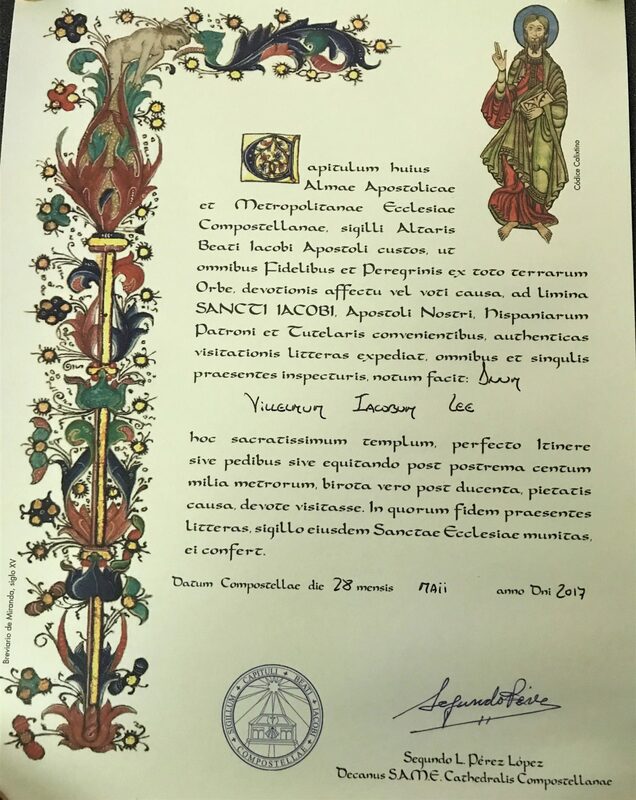 In confirmation of which I confer this certificate upon him/her, authenticated by the seal of that same Sacred Church. Afterwards we went off to see the Cathedral and attend the Sunday noon Pilgrim Mass. There were a lot of tourist buses in town and the Cathedral was packed by the time we arrived at 11:00 am. We couldn’t find a seat in the pews so we huddled on a stone pillar in one of the transepts. There had to have been 3,000 people inside that church. A very large number were just tourists who’d come to see the Botafumeiro. 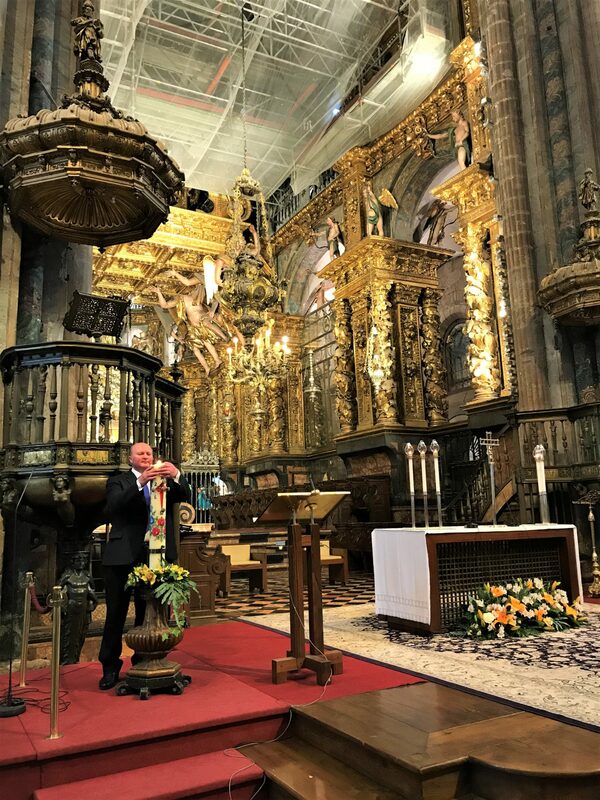 The Botafumeiro is a large incensory that burns incense and the name is Galician for “smoke expeller”. 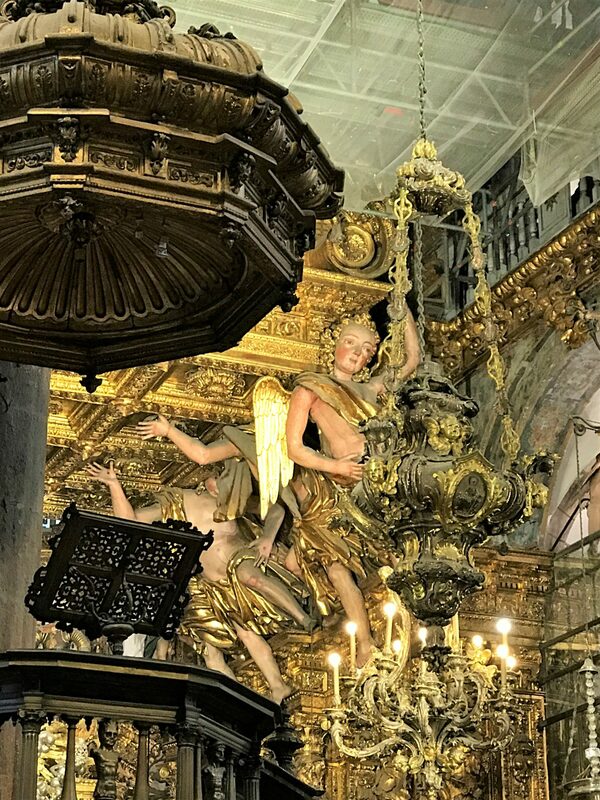 I think what bothered me most about the Mass was that the tourists where crowded in there just to see the Botafumeiro fly. As soon as it did they promptly left or started milling about. There was so much disrespect from these tourists that it was disgusting. The security guys kept having to go around telling them to stop talking or to stand up during critical parts of the Mass. They were obviously not Catholics and just wanted to watch the “show”. But they just didn’t get that it wasn’t a “show”. There was even a plea over the loud speaker that visitors please leave as the mass had started and visiting hours were closed. At today’s mass the Botafumeiro was used during the entrance processional due to the fact that a reliquary was processed. I did my best to take a photo but this thurible moves fast. I also was only able to video it toward the ends. There are much better videos of it online. My position was not ideal to fully video the swinging. But it was still quite the sight to see. The Mass was lovely with over a dozen con-celebrants from different parts of the world. The Mass was of course in Spanish but at several points there was an English translation. At the end of Mass there was an announcement that detailed the number of pilgrims who arrived in Santiago the day prior from, what country they were from, and where they had started the pilgrimage. It was exciting to hear them say how many Americans had arrived from Oviedo. We were two of them. The pilgrim blessing was said in the language of every pilgrim who had arrived. The English blessing was given by an Irish priest, Father Allen. Who we would later have lunch with as luck would have it. I don’t remember the exact words of the blessing but it was basically blessing asking that our futures be filled with health, joy, and the Holy Spirit. And that we all have a safe journey home. It was a very nice sentiment. It turns out that the pillar where we sat was directly in front of the statue of St. James Matamoros. What a fantastic statue that depicts this saint’s most well known aspect. That of the Moor Slayer. It shows him on horse back with body of a Muslim invader being crushed at his feet. The High Alter of the Cathedral is spectacular. With these enormous angels hanging from the ceiling. Normally, after this point pilgrims will line up to hug the giant statue of the Apostle James somewhere on the second level. Then walk down to his crypt. We chose to do neither of these things as the number of tourists lining up was just overwhelming. We plan to walk the Primitivo again so next time we’ll make sure to check those blocks earlier in the day. After mass we went back to our apartment to put away our precious Compostela and get ready to head back out to lunch. As we walked into the Cathedral’s square we saw these horseback pilgrims. Looks like they had made they obligatory walk into the square and where now heading out. Quickly. Before the horses decided to poop on the street! As we crossed back through the archway into the cathedral’s plaza we stopped to listen to this musician play. There’s always someone there playing music as the pilgrims walk through. We were too focused to stop yesterday so we took a few minutes to listen to him today. Please do give these buskers a few Euros in the box provided if you stop and listen. Especially if you take pictures. These buskers are trying to make a living entertaining and appreciate any tips you can provide. After mass we met up with Camino legend JohnnieWalker Santiago. We met him online and Billy is working on producing maps for The Confraternity of St. James’s guide books. He had invited us to lunch at the restaurant San Clemente and we were expecting it to be just the three of us. We were so surprised to find that it was lunch with a collection of incredible people. 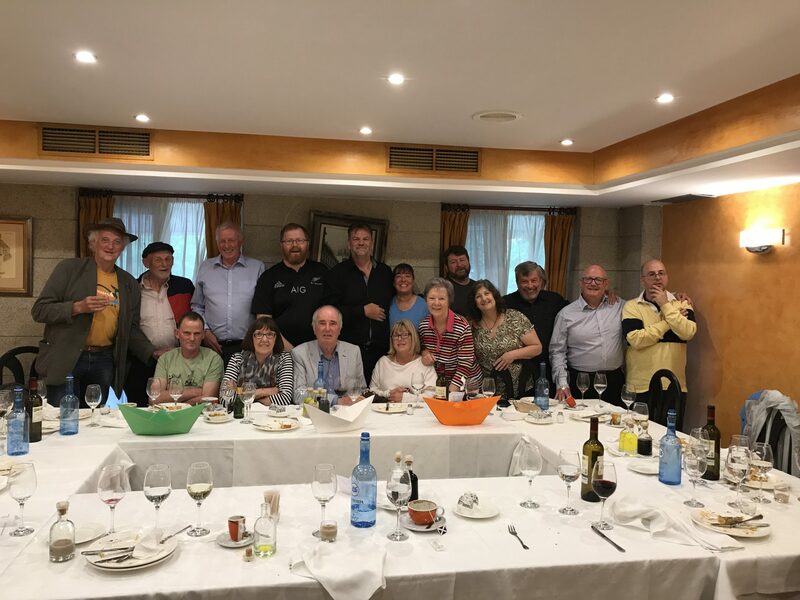 The most famous of whom were the Irish boat pilgrims that had made headlines in 2015 when they rowed to the coast of Spain from Dublin, Ireland in a boat of their own construction. They walked that boat into the Cathedral square. I remember when they did this and reading about it in the news. I never in a million years thought I’d ever meet them in person! This short documentary about what they did is worth watching to understand how honored we were to meet them. It’s short, only 3 minutes long. The decorations on the table are paper boats 🙂 Our main appetizer was melon wrapped in bacon made to look like a boat. We each one with a little flag from our country of origin. John is so clever. Over the course of the next 3 hours we ate and drank delicious food and wine. We were constantly serenaded with Irish folk songs since the majority of the group present was Irish. This was such a treat for Billy whose great grandparents emigrated from County Cork and County Laoish during the Great Famine. We’ve been back to Ireland twice and met his family there. His ties to Ireland run strong and deep and listening to these folks singing Famine and Republican songs moved him greatly. Here is a video of Breanndán Ó Beaglaoich, one of the boat pilgrims, singing in Gaelic. I apologize for the noisy background. We were in a restaurant and had this area to ourselves but the rest of the customers where right nearby so their voices can be heard. I was on the other side of the table and my iPhone just isn’t designed to drown out extraneous sounds. Many songs were sung that day and I missed recording Danny Mac Síthig when he recited one of his poems. He was sitting right next to me and I just didn’t have enough time or a good angle to record him. I greatly regret that now considering his fate in the weeks to come. However, I was able to capture Stephen Shields singing the Field’s of Athenry with everyone joining in. As background for those of you aren’t of Irish descent (or who are of Irish descent but your family failed to tell you of your ancestral history), Irish folk songs where a way for the Irish in the decades of the British oppression to record their history, since it had been made illegal by the British. They were forbidden from recording what the Brits did to them so they wrote folk songs to keep their stories alive. The song below that Stephen is singing wasn’t written until 1979 but it’s a great example of the type of ballads that were written in times gone by. The Field of Athenry is about a fictional man named Michael from near Athenry in County Galway who has been sentenced to transportation to Botany Bay, Australia, for stealing food for his starving family during the Famine. Seated next me to was the lovely Irish Sister Catherine, fcJ (Faithful Companions of Jesus) from the Camino Companions office. Camino Companions is an opportunity for reflection, sharing and quiet space in Santiago de Compostela for those who have walked the Camino. More information on what they have to offer can be found on their Facebook page https://www.facebook.com/pg/CaminoCompanions/about/?ref=page_internal. They offer any pilgrim the opportunity to talk about their experiences and it doesn’t matter whether they are Catholic, or religious at all. Think of them as counselors. They are there to provide pilgrims the opportunity to share their experiences and start to decompress from what they experienced. She is such a wonderful lady. If I lived in Santiago I could become close friends with her. Not for anything religious, just for the generosity of spirit and sweetness. Where were sisters like her when I was in Catholic school? In the picture below you can see Sr. Catherine and Father Allen. The Irish priest who con-celebrated mass at the Cathedral today and gave us the pilgrim blessing in English. I truly was fortunate today. Billy was seated to my left and next to him was Sybil Yates (SYates on the Camino forums)! Geez, Is there anyone that John doesn’t know? I’m saying the answer to that is no. Sybil is German and a veteran of many Caminos. She now lives in Santiago and has opened her home, which she calls Egeria House, to pilgrims in need. The link to her website can be found in my sidebar as well. Contact her for more information on what she offers. Also present were two Scottish couples Chris McKenzie and Andy Johnstone. They started as a group of five gentlemen who have been together since school and have walked the Camino in sections. Unfortunately, two have passed away now. This time their wives came along with them. JohnnieWalker has known them for 40 years and he tells a story of how surprised they all were when he was the one who wrote their Compostelas in the Pilgrim Office a few years ago. The other two couples present were Americans from Florida. Ari De Olivera and his wife Jeanette. They were in Santiago getting ready to work as hospitaleros. It’s funny how we represented the 2 state that are the farthest away from each other: Alaska and Florida. After the meal service was over we were served these little bottles of Orujo. That fire water that I tried in Oviedo on the night we arrive and swore never to touch again! I don’t know how my grandfather loved this stuff so much. I missed out on that particular Asturian gene apparently. Well, there were so many different types this time, and the bottles were so cute…I couldn’t resist. I think I drank the Crema de Licor by myself. Some are 40% by volume, others are 15%. All I know is that the pain in my feet went away for a while and I walked away from the restaurant without staggering. It was a good day. Before we all departed I asked for a picture of the group. The nice waiter was kind enough to take my phone and snap the photo below. This was the most memorable day of my entire pilgrimage. Thank You JohnnieWalker Santiago for bringing us all together. The following day we met with John again and he showed us around the markets. There were fish mongers and fruit stands everywhere. Some of them were not open because it was a Monday but it was pretty cool. Then he took us to his church. St. Agustin where he plays the organ for Sunday Mass. This was pretty cool for us since we had attended a Jesuit college and been married by a Jesuit priest. Finding a Jesuit church in Santiago was just unexpected. I had to ask the priest for a blessing. Which of course he graciously gave us. Of course, Old Santiago is a small place and we ran into Sr. Catherine on the way from the church. A few hours later we went over to John’s place and helped the Irish Pilgrims get their boat out of storage. They were back in town because they were going to take their boat back up to A Coruña where they had landed in Spain in 2015. Their plan now was to sail down along the coast of Spain and maybe to Morocco. So we spent a couple of hours that afternoon helping them get their boat on a trailer and on their way. What fun this was. Getting to spend another few hours with this crazy bunch of guys. They are speaking in Irish Gaelic so don’t bother trying to understand what they are saying. They only switched to English when they had to speak to one of us directly 🙂 What a beautiful sounding language. One last picture with the Irish Pilgrims. Billy decided to gift Brandon his Swiss Army knife and Leatherman. A parting gift for luck. He figured they could use the little tools, and the luck. Later the evening around 8:30 pm, Billy and I went out for dinner (Because eating late is what you do in Spain and what we do at home too). We found this cute little place with delicious food. Not to mention the entry was adorable. The seafood paella was made to order and was fantastic, as was the Sangria! On our way back home around 10:00 pm we came across the Tuna de Derecho de Santiago de Compostela playing in the Obradoiro square. The song they were playing was Guantanamera! Obviously, I was immediately drawn to a group playing a traditional Cuban patriotic song. The Tuna is a group of university students in traditional dress that play traditional instruments. The tradition started in the 13th century as a way for students to make money. Now they continue the tradition, not because they need the money to survive, but to keep the tradition alive. Of course they take tips and sell their CDs at these nightly performances. They are very good and this is only a small group of them. They are very good musicians and they play nightly from 10pm to midnight. Because Spain doesn’t even go to bed until midnight 🙂 I love that country. This was how our pilgrimage to Santiago ended. We’ve already decided that we will be back to Spain for a third visit and that we want to walk the Primitivo again. But next time we will take several more days for the walk so we can enjoy the little villages. We rushed through so many places that I would have wanted to spend a little longer exploring. But arriving at 3pm in the afternoon, exhausted and in pain didn’t make for ideal conditions to walk around the towns. Next time I’ll wear boots for sure and plan the trip to be in a colder month. Maybe April (Easter) or October. My next post will be about the few days that we spent on Illa de Arousa. A small fishing village on the only island in Galicia. Thanks for the blog. Seems to me like rowing or otherwise boating is the way to do this. Avoids the foot pain. Fantastic story. Really nice of you to write it up for others to read. Thanks. Unfortunately my follow up blog is a memorial. The Irish boat Pilgrims had a tragic accident 2 weeks later. One of them didn’t make it and the boat is wrecked 🙁 It’s very sad. Ah geez that is such sad, sad news. Nonetheless, is anothet blessed memory you and Billy share. Oh my gosh, Irene what a absolutely lovely last post of your Camino Primitivo. And to meet so many celebrites…ah gee I am very happy for the both of you. May your days be filled with continuing joy. Thank you for taking me on this journey and for including bits and pieces other bloggers did not. It was truly my pleasure. I’m very happy you enjoyed reading it. I always wonder if anybody even cares so I appreciate your frequent comments Judy. Muchas gracias Inés. Regresamos a tu apartamento la próxima vez que estemos en Santiago. 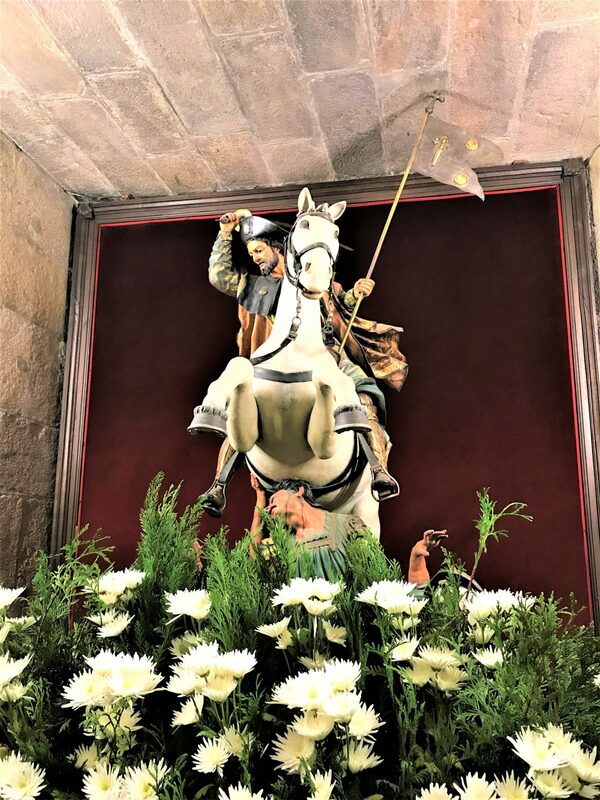 Este blog representa una buena imagen y trayectoria del camino y de la ciudad de Santiago de Compostela. apartamentos Casa de la Inmaculada, en el corazón de Santiago de Compostela. Thanks so very much for this generous share. So very moving for us. We’ve walked the Camino Francis (2014)…The Dingle Pennisula (2015) and The West Highland Way (2016). We leave for Lisbon and the Camino Portuguese on August 21. We so loved Ireland crossed the Carrick Bridge and marveled at the Cliffs of Mohr. Coupled with Scotland and our Camino they have been such spiritual experiences. What a blessing you were to the rowers and I’m sure they to you. Not to mention the gift of John.❤️? ?